Lisa Schultz (Organizer of the Peace Project) was moved by photos of victims of the African country’s civil war. Check out this Interview of her on Channel 5 news in LA discussing her movement. James Gurney is an artist known for his plein-air landscape paintings, as well as his award-winning illustrations of fantasy and historical subjects. He is also known as the author and illustrator of the best-selling illustrated book series, Dinotopia. 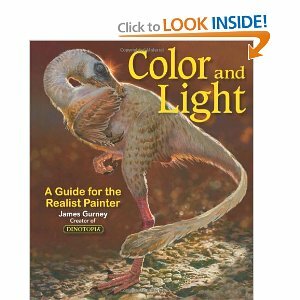 I want to say that this is the best book I’ve read on Color Theory & Light. It’s not to technical or dry. It’s very good reading with excellent art examples from Gourney and modern-day artists. It shows you various ways to approach painting with light and color options you’ve probably never thought about. With this book I now have more methods to experiment with, and it also pushes me to get out of my comfort zone when choosing color palettes to paint with. he also gives you things to think about such as; themed colors for moods and purpose, limited color palettes, composition, etc. I give this book 5 out of 5 stars. You are currently browsing the Urbanrockwell's Blog blog archives for September, 2011.